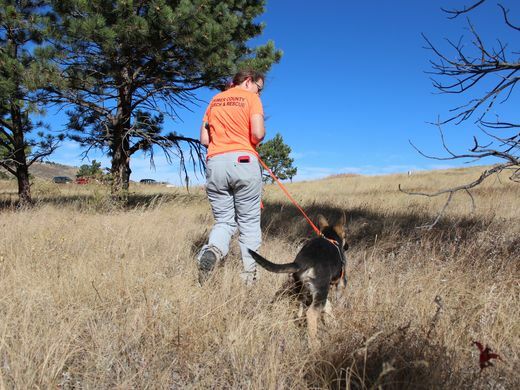 COLORADO – A little German shepherd is wondering around a filed in search of something, or someone. Suddenly starts to run and reaches a tree, where a woman is waiting for him and rub his back erupting in cheers. Her name is Wendy Nicastle and she is both trainer and owner of Max, a 10-week-old German shepherd puppy. They are playing hide and seek through the grass of Lory State Park. She crouches on the ground, trying to hide and when Max gets her, she rewardes him with cheers and with some good snack. Apparently, it seems they are only playing, but it represents a fundamental exercise to become a good rescue dog. 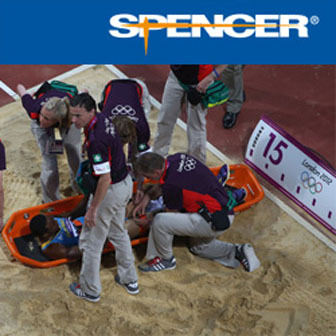 If this Sunday’s exercise means just a game for Max, finding a person in the future could mean life or death. Hide and seek game is the beginning of mor than 2,000 hours of training. This is what makes a rescue dog. Max is demonstrating to be a corageous and indipendent dog, exactly what Nicastle wanted. In particular he turned out to be resourceful, for example, when he met a group of 10 search and rescue team members, he did not shy away from them. In fact, he introduced himself to each of them individually, which Nicastle considered as a big step for a puppy. Why hide and seek game for a search and rescue puppy is so important? It is apparently a game, but the way the dog is treated, the rewards and the constant training will determine an important base for more complicated trainings. The dog learns how to follow a track and in particular, which one to follow. The dog must learn to use his instinct correctly, without distract himself from the track he has to follow. After the phase of hide and seek game, next training will consist in miles-long scent trails through the woods made by trainers, that he will track. Nicastle does not train Max alone. Usually dog trainer veterans Jake Udel and Dan Fanning — who have been with LCSAR (Larimer Country Search and Rescue) for 11 and 34 years, respectively — joined their Sunday train. Fanning brought his yellow Labrador, Tripp, who is already certified, as well as puppy-in-training Milo. 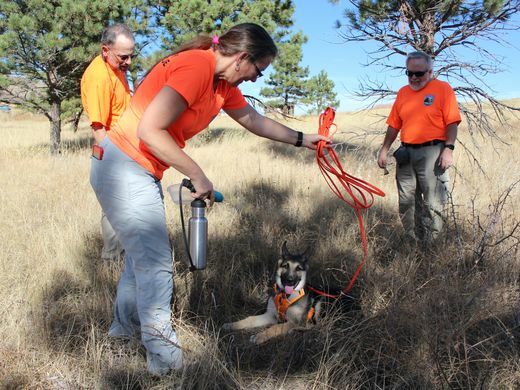 LCSAR volunteers train their dogs at least once a week for years, so they can be always ready in case of emergency. Udel and Fanning helps Nicastle with Max’s exercises, made sure he drank water and lent Nicastle a mesh tarp she can use to keep her car cool when Max is inside. Once Max is ready, he’ll take certification tests and begin joining Nicastle on rescue missions. Source and photos on Coloradoan.